The stock gearing version of our popular Freeway Flyer Swingaxle Transmission for 1968 and older Beetles, and many Dune Buggies and Sandrails. 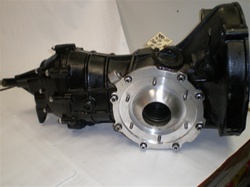 This is a remanufactured VW swingaxle transmission, that uses the same high performance parts as our Freeway Flyer Swingaxle Transmission with the stock ring and pinion ratio of Original Equipment VW Swingaxle Transmissions. This is your easiest, quickest and most convenient way to replace a malfunctioning transmission in your 1968 or older VW Beetle or Ghia. We have been rebuilding vw transmissions for over 30 years and every rebuilt vw transmission goes thru a rigorous process of cleaning, inspecting, rebuilding and testing to ensure that it will function properly for you upon installation. All air cooled Volkswagen transmissions are road tested in an actual vehicle to check upshifts, downshifts, and reverse. All transmissions come with a One Year Parts Warranty. We also make it easy for you by having NO CORE REQUIRED; which means there is no hassle of sending us your old core or hidden extra expenses that are common with our competitors. This transmission is Rebuilt off Original German Core Transmissions. This means the cases are 45-50 years old. They will not be cosmetically perfect and most likely will have some pitting. All transmission cases are bead blasted, inspected, and painted with heavy duty high temp rust protectant paint. If you are buying this transmission for a show car, I highly suggest spending the extra money if you are in need of a cosmetically perfect apperance. Otherwise the Original German Case will function perfectly for your driving needs. All high performance transmission include only 1 heavy duty side cover because only 1 side is load bearing. If you wish to have an extra billet side cover for appearance, please check the option below. You MUST provide us with the length of your axles to insure that no extra modification is necessary during or after installation.